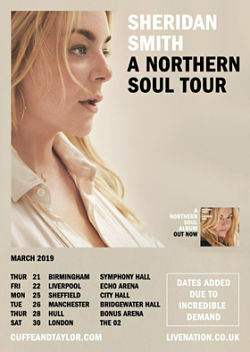 Star of West End smash hits including Legally Blonde and Funny Girl, Sheridan Smith has announced that due to demand further dates have been added to her A Northern Soul Tour in March 2019. She will be performing tracks from her discography as well as new music from her new album A Northern Soul, which was released on 2nd November. Sheridan has won Oliver Awards for her roles in hit musical Legally Blonde and the 2012 production of Terence Rattigan’s Flare Path, has also won a BAFTA TV award for her role in Mrs Biggs (playing Great Train Robber Ronnie Biggs’ wife), and a National Television Award for playing ‘60s pop icon Cilla Black in the acclaimed TV dramatisation about the singer’s life.